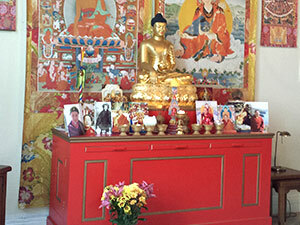 Rigpa Cork established in 1994 is a centre for the study and practice of Tibetan Buddhist meditation. The centre, located in the heart of the city, provides support and a refuge for both practicing sangha and those new to meditation. The Cork Centre endeavours to create and provide a warm and welcoming atmosphere for all. ‘Time to Meditate’ is not an introductory course in meditation but rather an opportunity and space just to sit and practice meditation together. On alternate weeks we will also include a guided Loving Kindness practice. You are welcome to join us for a cup of tea afterwards. These sessions are open to all and suited best for those with previous experience of meditation. No booking required. Registration on 25th at 6.30pm for 7pm start. This module focuses on integration: how to integrate meditation in action so that practice and everyday life are no longer separate. Many contemporary buddhist masters emphasize how important it is to find a healthy and even balance between meditation practice, relationships, family and work. In this course we show how we can apply meditation in everything we encounter and in everything we do – whenever and wherever we are, in every situation. Please don’t let finances be an obstacle, contact us if you have difficulty meeting the fee. The AEP home study programme Jan – June 2019 – please contact centre for dates. Rigpa Cork is part of the registered charity Rigpa Ireland CHY 19478 RCN 2007645.